Hey everyone! I\'m trying to make a sort of Angel chart here so we can know who are the best angels at each level (And to find out who my next main angel should be). I haven\'t gotten my hands on a single lvl. 90 angel yet, however, I\'m expecting to get Aphrodite or Hemera soon. My current Angel is Aoede. 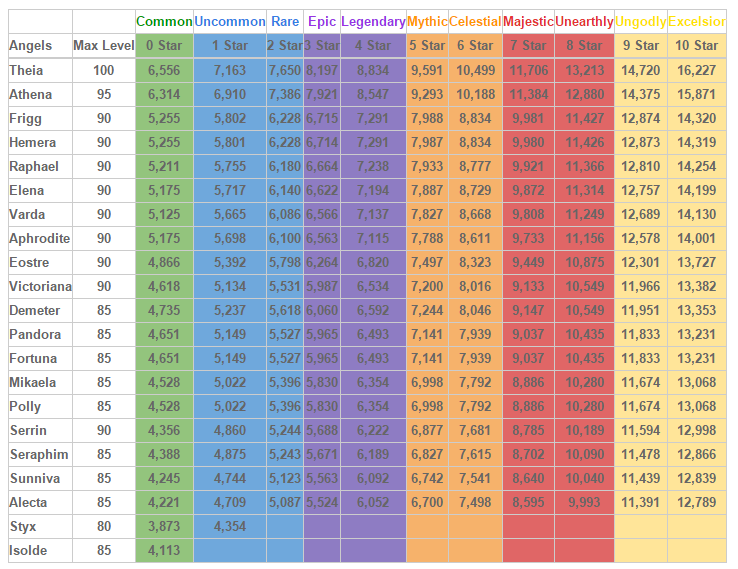 I hope this list benefits players old and new (unless you\'re a player who has 5+ level 90 angels because sadly this list does not currently help you at all ^^;)! I\'m currently grinding Fortuna and Mikeala. Pandora and Sunniva aren\'t far behind. (There is a mistake as well I do not own Seraphim.... yet.) Sadly, due to almost a;year\'s worth of hiatus my level is still in the 60s. ;Who should I replace Aoede with? Based on the above chart I should probably switch Aoede with Pandora or Fortuna but I\'m still not too sure just yet. Any suggestions? This Chat is based on Guardian Angel Ability. The most powerful is on Top.So the more u go down, the less powerful the angel is. i wish someone with account on S0 update the table that Tokkie did leave . The Chart that King Posted above was made by Tokkie. 2019-4-19 01:13 GMT+8 , Processed in 0.062509 second(s), 52 queries .